KC Area Workers’ Comp Attorney | Besse Law Office P.A. Getting the Run-around from the insurance company? the responsible parties accountable. Let's fight for what you're owed. Injured on the job? Hurt in an auto accident? Contact an experienced Kansas City worker's compensation and personal injury attorney at Besse Law Office P.A. in Kansas City, MO and Overland Park, Kansas. Protecting and aggressively pursuing the rights of workers in worker's compensation cases and victims of personal injury is our passion. We fight to get you all of the compensation and benefits that you deserve. 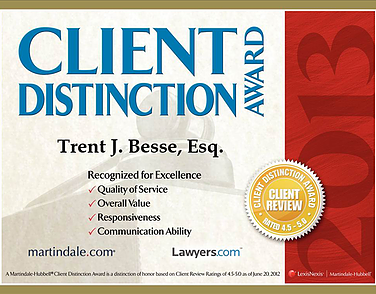 Trent J. Besse has more than 24 years of experience in the areas of worker's compensation and personal injury. His background includes working for one of the largest personal injury and workers compensation law firms in the Kansas City area, as well as previously working as an insurance company defense lawyer. Bottom line: he knows how to get you the maximum recovery. Cases are handled on a contingency fee basis, meaning you don't pay unless he is able to recover for you. Mr. Besse is licensed to practice in both Kansas and Missouri state and federal courts, and injury cases are accepted in the Kansas City metro area. Offices located in both Kansas and Missouri. "MY FATHER WAS INJURED ON THE JOB. I'VE DEDICATED MY LIFE TO HELPING PEOPLE LIKE HIM." Unlike most law firms that carelessly pass you off to an assistant or paralegal, I’ll work directly with you from day one. I understand how frustrating this situation is for you. That’s why I take pride in being as responsive as possible throughout this time. My desire is to put your mind at ease by fighting for justice on your behalf. Knowing your rights is the first step to success. If you get hurt while you’re at work, you’ll want to notify your employer, contact me, then file a claim — in that order. WHAT IF MY EMPLOYER’S DOCTOR SAYS THERE’S NOTHING WRONG? You can always ask for additional treatment from your employer. However, if they refuse, the judge can see to it that you’re seen by another doctor. You could still receive compensation even if the accident was your fault. With workers’ compensation, fault doesn’t typically matter. THE INSURANCE COMPANY OFFERED TO SETTLE. WHAT NOW? Usually, the settlement is much lower than what you could actually receive. By settling, not only do you forfeit a larger compensation, but you also lose out on them paying for future medical bills. Terminating an employee for filing a claim is against the law. If you were fired after doing so, give me a call right away. CAN I CLAIM WORKERS’ COMP BENEFITS AS A CONTRACTOR? Usually, independent contractors are actually employees. If this is the case for you, you could very well be covered. You have a better shot at your case with an attorney by your side. Most of the people who come to me work hard to provide for themselves and their families. I help them level the playing field against employers and insurance companies. What you’ve experienced isn’t fair and it isn’t right. The injury alone is already tough. You don’t have to face the legal battles that ensue by yourself. In situations like this, it’s not uncommon for companies to do whatever it takes to protect their end. They may try to get you to sign statements that could potentially limit how much compensation you receive. While you want to get to a doctor and file your claim as soon as possible, it’s always best to handle these matters with an attorney by your side. In doing so, you’re more likely to collect funds that cover your medical bills, time off, and general pain and suffering. Before you make any major moves, call me. Let's change it — together. There are many types of injuries that can happen on the job. From slip and falls to occupational disease, workplace injury has a wide range. Once you’re aware of your injury, you’ll want to notify your employer right away. Your next course of action is going to be to contact me. Having an experienced lawyer by your side is key. I have helped a countless number of injured workers get the benefits they deserve and I can help you, too. Time is of the essence, so you’ll want to file your claim quickly. Here in Missouri, you have two years from the date of your injury or one year from the date of your last check to file — whichever occurs later. "I was hurt at work and Trent got me all the benefits I was entitled to." "The insurer did not want to pay, but Trent made them pay." "If you’re looking for someone that you can trust, someone who has your best interests in mind, and someone who will be in your corner no matter how long it takes, Trent is your guy." There’s no place quite like the midwest. From rolling hills and farm life to booming art districts and the best barbecue in the country, Kansas City is an incredible city to settle down in and raise a family. It brings me great pleasure to help the people here continue to thrive. That’s why I have an office in Kansas City, Missouri as well as Overland Park, Kansas. You’ll be able to get the help you need regardless of which side of the state line you reside on. For over 22 years, I’ve helped people receive fair compensation for their workers’ compensation, personal injury, and social security disability cases. If your job resulted in getting hurt or contracting a disease, I can help. If you were injured due to the negligence of someone else, I can help. If you need to apply or reapply for benefits because you’re not able to work, I can help. Whatever it is you’re facing, I have the experience to be your advocate. I'm happy to make home and hospital visits. © 2019 Besse Law Office P.A.